In which we try (and fail) to get the alternative dialogue at the end of the fight with The Mechanist if you are dressed as The Silver Shroud, due to a glitch. But we do see what happens if you just kill The Mechanist instead of talking to them. Click Here to see The Silver Shroud Ending on another site. Inspired by the revelation of Zoom's true identity, Barry becomes more determined than ever to find a way to increase his speed without turning to the Velocity drugs. This leads Barry to travel back in time to seek the help of the one person who knows how to train as a speedster - The Reverse Flash, Eobard Thawne! But the universe has ways of dealing with time-traveling speedsters and Barry will have to outrun the so-called Time Wraiths while trying to avoid further damaging the time-line. You'd think Barry would have learned his lesson about altering the past by now. Granting that he has to improvise a bit when he arrives too early, that still doesn't excuse his thwarting Pied Piper's escape. As usual, Tom Cavangh steals the show as he plays Eobard Thawne once again. And in his final scene as Harry Wells. Grant Gustin gets some great moments here as well, both playing against himself and in his battle of wits scene opposite Tom Cavangh. And the final scene with Iris is Gustin at his sweetest ever as Barry Allen. The fight sequence between the two Flashes is nicely handled. The script is well-written, with a perfect balance of humor, action and drama. As the episode opens, Barry is hard at work on developing a Speed Equation that will boost his powers. This is a reference to the mathematical formula recited by the speedster heroes Johnny Quick and his daughter Jesse Quick to access the Speed Force. Later in the episode, when Barry, Caitlin and Cisco are looking at the information Thawne gave to Barry, the speed formula - 3X2(9YZ)4A - is visible at several points in the hologram. Thawne identifies the ghost that is chasing after Barry as a Time Wraith - a being that exists to destroy speedsters who travel in time and alter the timeline before they can cause serious damage. The Time Wraiths - in appearance and power - appear to be similar to The Black Flash. The Black Flash is a being in The Flash comics who is basically an angel of Death for speedsters, trying to grab them and draw them into The Speed Force. Cisco refers to the Time Wraith as Inky - one of the ghosts from the Pac-Man video game. Piper's reformation in this episode is not without precedent. In the original comics, Pied Piper was the first of The Rogue's Gallery to reform and become a part-time superhero. He primarily worked as a social crusader who fought for the poor and needy. He also outed himself as homosexual and became a vocal LGBT activist, noting the irony of his being the first Rogue to "go straight". Caitlin determines that The Flash, Reverse Flash and Zoom all move their legs at essentially the same speed. What allows Zoom and Reverse Flash to move faster than Barry is their feet spending less time on the ground between strides, which propels them forward at least 30% faster. Wally's adviser wants him to help her with a project based around pushing the speed limits of smaller propulsion systems. Thawne advises using sound stimuli in Pied Piper's cell to counteract his tinnitus after removing his hearing aids. Time Wraiths only go after time-travelers and speedsters who do not know what they are doing, according to Thawne. Pied Piper is able to drive off the Time Wraith by projecting a certain frequency through all the speakers in the cells of the STAR Labs Pipeline. He theorizes an exact frequency could cause the Wraith to dissipate. Cisco is unable to repair Pied Piper's gauntlets. The electron guns are fried and the battle with The Flash shorted the wave tubes and destroyed the amplifiers. Cisco also doesn't know how to manipulate the frequency variance. Thawne says the key to increasing Barry's speed is tachyon enhancement. In the present day, Piper is able to disperse the Time Wraith by using a sonic blast that is low in frequency and high in intensity. Barry: I let it happen again. I trusted someone I shouldn't have. Jay Garrick. Zoom. Just like I trusted Harrison Wells. Or Eobard Thawne. You see what I mean? I made the same mistake twice. I thought they wanted to teach me how to use my powers, train me to get faster. But they didn't come here to help me. They came to use me. And take everything I love away from me. But no more. I'm going to crack the code, figure out how to improve my speed. I'm going to train harder, get stronger and run faster than anyone's ever run before. And then I'm going to stop Zoom. Barry: Can you track it? Cisco: What is it with you guys? It's liek you all think I have ESP or something. I can't just magically sense where things are! Barry: Is this about the speed equation? Thawne: As a matter of fact, it is. Barry: (sitting down) Oh, great! Okay. Good. So you figured it out? Thawne: Yes. I figured it out. Barry: The Speed Force. You manipulated it. How did you do that? Barry: No! No! No! Hey! Hey! Hey! It's the opposite! You trick me. You harness my speed. We turn on the accelerator and create a path for you to go home. I go back in time. You go back to yours. You won! Thawne: Then why are you here? Why are you here now?! Barry: Because when I got back a singularity had formed. And now the only way for me to learn how to get faster and stop the singularity from happening was to come here. Now. Thawne: Well that's good to know. (sighs) There's just... just one thing that occurs to me. I don't need you. Do I? Not THIS you, certainly. Oops! You probably should have thought of that before you came here. Shame... (laughs) You ran all the way back here just to die. Barry: You kill me, Barry... this Barry - your Barry? He learns it all. There's a hidden letter telling him how it ends. How to beat you. Everything. Anything happens to me? You never make it back home. Barry: Go on. Kill me Thawne. See how this all ends. Barry: Now, you're going to help me get faster. It's a quick moment but Cisco's playing Rick Astley's Never Gonna Give You Up through the speakers of Piper's cell and staring at him expectantly is a nice gag. Past Barry: Okay. So I'm - who are - who are you? Caitlin: Who is he? Who are you?! Barry: No. Not yet. I am you, Barry. Just... different. Cisco: Wait a second - how do we know which one's the real Barry? Past Barry: Dude! Okay. I've watched Wrath of Khan with you like five times. Cisco: (pointing to Barry) Impostor! Barry: Yeah. And every time, at the end, you turn to me and you say, "I have been and always shall be your friend." Cisco: (the hand pointing at Barry makes the Spock gesture as Cisco points at Past Barry with his other hand) Haha! You impostor! Cisco: What is going on here? Barry: Okay guys. I'm sorry. This was not supposed to happen. The tranq dart that Caitlin made was supposed to last a lot longer. Caitlin: I did -NOT- give him a tranq dart. Barry: Okay, no, yes. Not you. The you from the time that I am from. Past Barry: The time that you are from? Thawne: I think what he's trying to say is he's from the future. Past Barry: Are we saying I can time-travel? Thawne: (to Cisco) Stop talking (to Barry) You stop talking too. Harry: I don't know what I've done. Barry: You did what you thought you had to do. You risked your life to save her. You brought her here to protect her from Zoom. You acted like a father. Harry: Like a father. You know, my wife had to... talk me into having kids. Kids. They're small, loud, run around... All I needed was my science and my job for my joy and happiness. And then... the moment we had her, all that I wanted was... her love. Now? I wonder if I'll ever see that again.It seems every decision I've made lately has backfired on me. Barry: You just have to trust that in the long run you made the right ones. Eddie: What does Iris mean to me? Wow. You know, a lot of times I have a hard time figuring out what to say to people. But when it comes to you, Iris, I don't. Because with you, everything that used to feel tough just doesn't anymore. It's one of the things I love about you. You don't need me. You can handle anything on your own, because...you're fearless. And independent. Loving. Kind. You are, without question, the best decision I ever made, Iris West. And I never thanked you for choosing to be with me. Because each day with you is a gift. So, thank you. You deserve the world, Iris. You deserve to be happy. And nobody wants that more for you than me. Happy Birthday, baby! I love you. Barry: Sometimes the only way to move forward is to revisit the things in the past that were holding you back. You have to deal with them head on, no matter how scary they may be. Because once you do, you'll see that you can go further than you ever imagined. Cisco has another vision of Zoom dangling a woman over a roof-ledge when he approaches Jay Garrick's helmet. Cisco refers back to the events of 213 and how well Barry impersonated himself on Earth 2, when Barry suggests going back in time one year and pretending to be his old self. 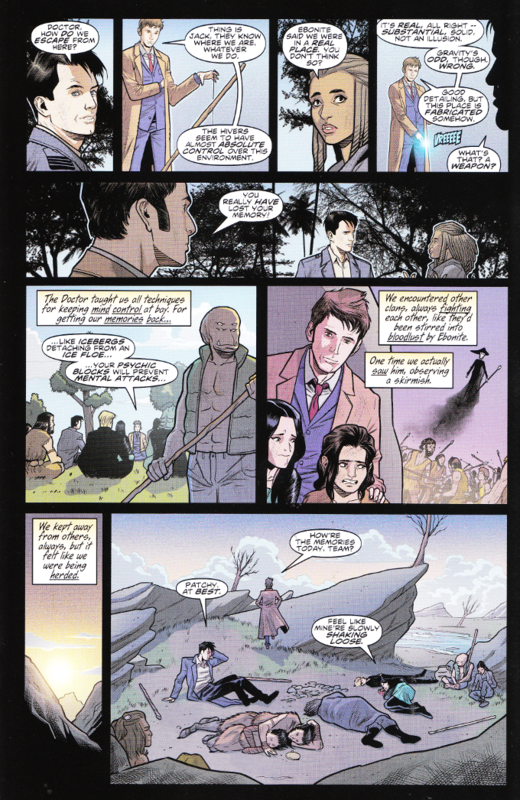 Barry refers to how he saw his mother's death in 123. Barry travels back to the time of 111, just as he was first fighting The Pied Piper. As Barry is running to the past, we see visions of The Singularity opening and Eddie Thawne getting shot (123) and his second fight with Pied Piper (111). Barry's first change to the past comes when the comms on his cowl cause interference due to his proximity to his past self. This interference is noticed in STAR Labs, and forces Barry to more directly take out his past self to deactivate his comms. Barry's second change comes when he warns Cisco about Pied Piper's hearing aids also being potentially explosive. This prevents Piper from escaping as well as his second battle with The Flash from occurring. This leaves Piper in his cell when the Time Wraith first attacks STAR Labs and he is able to use his gauntlets to drive it off. Thawne says they'll make Piper some non-explosive hearing aids that will treat his condition. This may be what leads to the changed timeline in the crossover episode with Supergirl (S118), where Barry is able to create ear-pieces that counter the abilities of Silver Banshee. While in the past, Barry has Eddie Thawne record a special message for Iris, so he can give it to her in the present just before the anniversary of his death. 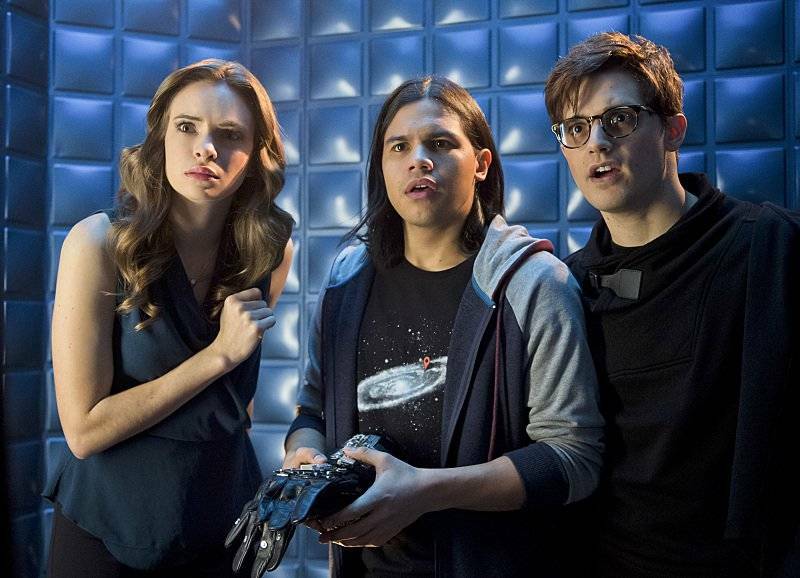 The third change Barry makes is in revealing himself to Cisco and Caitlin, after his past self recovers from the tranquilizer much faster than expected. The fourth change Barry makes is telling Cisco to ask Pied Piper about Ronne Raymond, since the chance Cisco had for Piper to bribe him with the information won't happen in the altered timeline. In the altered timeline, Pied Piper is reformed and reconciled with his parents. He also knows Barry's secret identity and is apparently on friendly terms with the STAR Labs team. Harry Wells is still trying to find Jesse as of this episode. Harry says it's easier to find a two-ton gorilla on Earth 1 than a teenage daughter, in reference to 207. Thawne refers to having met other speedsters besides Barry Allen. Caitlin briefly mentions that she wants to stop Zoom as badly as Barry does. It's good that they mentioned it, but it still seems like they are brushing the fact that Caitlin's trust in Jay Garrick was abused far more than Barry's. As betrayed as Barry feels by having had yet another mentor betray him, that's nowhere near as serious as Caitlin being romanced by a super-villain who was lying to her from day one. Again, Barry totally forgets his previous experiences attempting to alter things in the past or in an alternate reality. This time, however, things seem to work out for the better, with Pied Piper now apparently an ally of Team Flash in the present. A great episode, flawed only in that we could have used some more time to establish how things changed with Pied Piper. It's still one of the best episode of the series ever. Under the leadership of Jason Bard, a new organization has begun to fight against Superman in the name of The Joker. 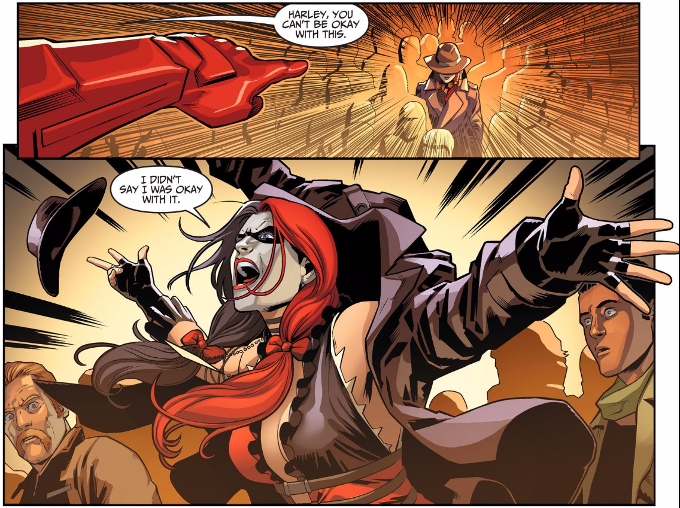 Batwoman aims to put a stop to this before Bruce (who is celebrating his birthday as best he can) finds out. Unfortunately, she runs into another missing ally at The Jokers rally - Harley Quinn! Oh, how I long for the days when a trench-coat and a fedora were all the disguise a superhero needed. But that's not the only thing about Brian Buccellato's script for this issue that has me feeling nostalgic. Seeing Jason Bard - the Marine turned detective with the bum knee, who was once engaged to Barbara Gordon - was a pleasant surprise. 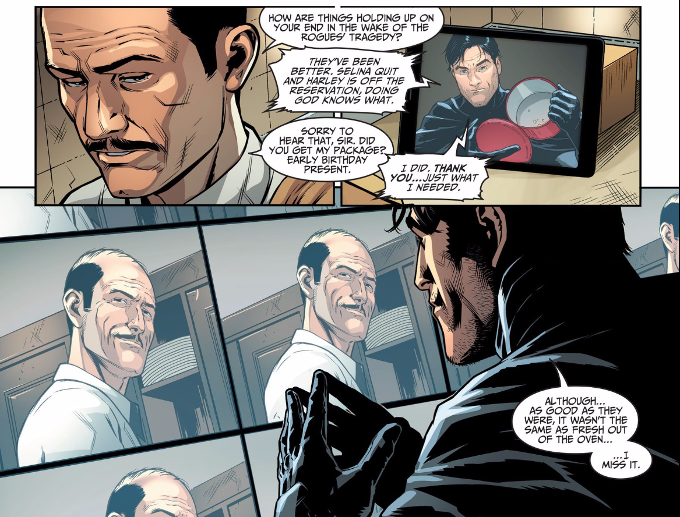 And the scene between Alfred and Bruce is one of the sweetest things I've ever read involving the characters. The artwork for this issue is magnificent. Bruno Redondo is one of the best artists in the business and I hope he'll find a title worth of his talents when Injustice comes to a close. His work is perfectly enhanced by the inks of Juan Albarran and the color art of Rex Lokus. I saw Batman V. Superman for a second time as part of the bachelor party for my friend Roy Buckingham, who, incidentally, does a podcast you might enjoy if you like my work. I scribbled down these random thoughts as the movie progressed. Naturally, they are full of snark and SPOILERS, so don't read this if you haven't seen the movie or can't bare to have me pick apart some of the problems. 1. While I regret the necessity of needing to yet again show the death of Batman's parents, I must say the opening credits sequence does accomplish that task in an efficient manner. 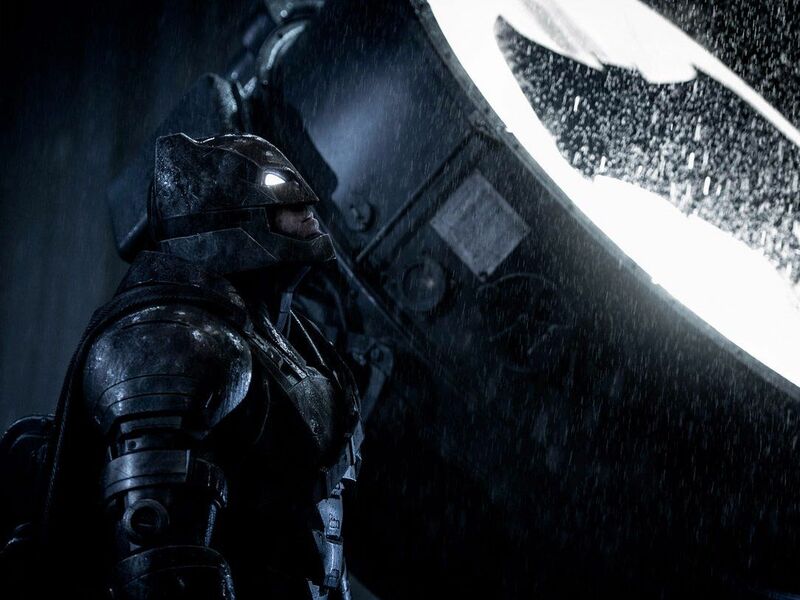 Like it or not, a filmmaker cannot assume that EVERYONE knows how Bruce Wayne became Batman. But the bats lifting Bruce up to the light is a major "what the hell?" moment that had me laughing the first time I saw it before I realized it was a dream sequence. 2. In many ways, the dream sequences/hallucinations are the biggest problem with the movie structurally. None of these scenes serve any purpose other than setting up things for the sequels that make no sense now or being artsy for the sake of being artsy. And Zack Snyder is at his most insufferable as a director when he's being artsy for the sake of being artsy. 3. Didn't the US Military establish a no-fly zone around Metropolis when they were sending in the plane with the pod to destroy the Kryptonian mothership back in Man of Steel? If so, then how is Bruce Wayne able to get a civilian helicopter to fly into the middle of a war zone? Apart from being rich and the rules not applying to him? 4. I had thought it was a little weird that Metropolis and Gotham City are on opposite sides of a body of water. But according to the latest DC Comics Atlas, that's the case. They're twin cities on opposite sides of Delaware Bay, with Gotham City in the location of Cape May Point, New Jersey and Metropolis in the location of Lewes, Delaware. 5. I do love the moment of Bruce saving and then hugging the lost girl. That is everything you need to know about Bruce Wayne in a nutshell in one scene. He'll risk his life to save another and he's got a soft spot for kids and orphans, despite his personal darkness. And Ben Affleck NAILS that. 6. As powerful as this moment is, however, I have to wonder how the heck that girl got to the ground floor and out of the building, unattended, in the first place. 7. This is another major problem with the movie - there are some great sequences, but the steps taken to set up those sequences don't make a lot of logical sense. 8. Let's give some praise to the costume designers. 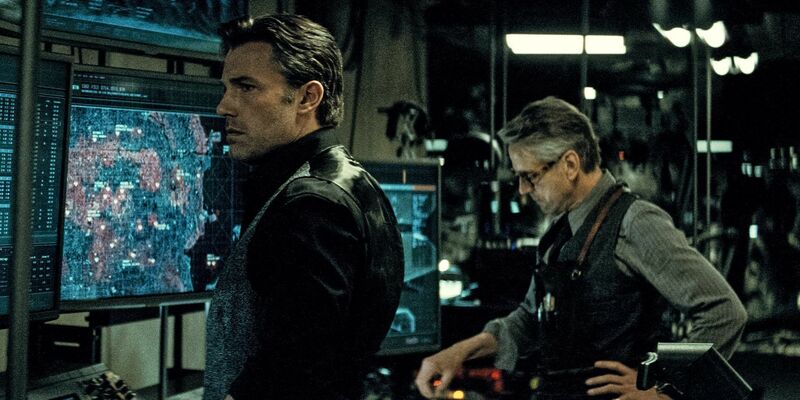 Bruce Wayne is clad in dark blues, grays and black throughout. Clark is dressed in lighter shades of blue. It's a nice, subtle touch. 9. Even though some parts of Africa have a Christian population as high as 75%, it still seems weird for the woman being interviewed by Congress about her village being destroyed to say that Superman doesn't answer to God. 10. The scene of the bathtub overflowing as Lois and Clark "get friendly" is probably the most subtle metaphor in the whole movie. I thought it was the female equivalent of a rocket going off. Which means it was probably an accident. 11. RE: The Bat-Symbol Brand (TM) on the criminals. This is another nonsensical element that exists only to give Superman a reason to distrust the more extreme Batman. It's also a blatant rip-off of The Phantom's Skull Ring. 12. So, we're told that the public is split on whether or not Superman is a hero or a menace. Yet Metropolis saw fit to make a statue of him the centerpiece of a memorial for those killed in the Kryptonian invasion. I'm willing to bet more than a few city councilors got voted out of office over that, since many people would equate that with building a statue of Adolph Hitler in the middle of a Holocaust memorial. 13. For all the complaints about things this movie got wrong in adapting the comics, I haven't heard anyone complain about Perry White. Laurence Fishburne does a good job with the character as written but there's no hint of the idealistic old-school newsman from the comics in his portrayal. His seeming annoyed about Lois and Clark wanting to go after big news stories is confusing on every level. 14. That being said, his later anger at Clark neglecting two assignments so he can write about a vigilante in another city is justified. Which makes it all the weirder later when he gives Lois a helicopter, no questions asked. 15. The dream sequence with Bruce visiting his parents grave is Snyder's direction at his most self-indulgent. 16. Did everyone see that stained-glass angel in a blue tunic with a red toga in the Wayne crypt? 17. Lex Luthor's speech to the Friends of the Metropolis Library comes off as the worst TED Talk ever. 18. 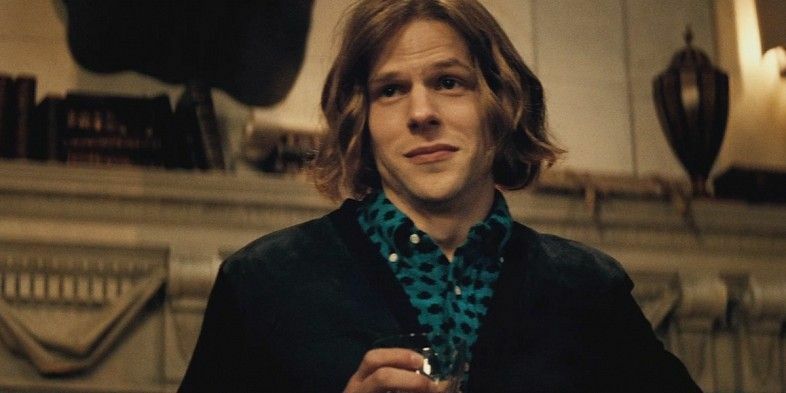 Is it just me or is Jesse Eisenberg channeling Johnny Depp's Willy Wonka for his portrayal of Lex Luthor? When he invites Bruce Wayne to his lab to see what he's cooking up, I half expected for him to say he's finally perfected the Everlasting Gobstopper. 20. 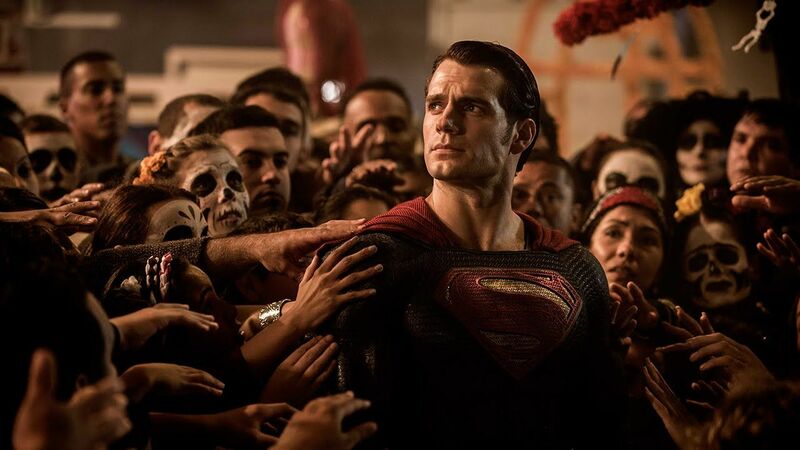 On that note, I think Henry Cavill does great work with what he is given but he isn't given much to work with. His best moments come early on where we see him and Lois interacting as a couple. Where Clark is the guy who tries to surprise his girlfriend with flowers and a home-cooked dinner. Where he's the guy who doesn't much care what the world says about him because he's content with his life and the love of a woman who makes him feel like the greatest man in the world. THAT is the character we want to root for and one we should have seen more of. 21. Another great visual that makes no sense if you think about it - the people trapped by rising floodwaters on the roof of their home who paint a giant Superman symbol on the roof of their home. So they didn't have time to flee their homes but DID have time go grab the paint before climbing on the roof? 22. One of the reporters asks "Must There Be A Superman?" Nice shout out to a classic Elliot S! Maggin storyline though I wonder why he wasn't listed among the writers and artists who were given a shout-out in the closing credits? 23. 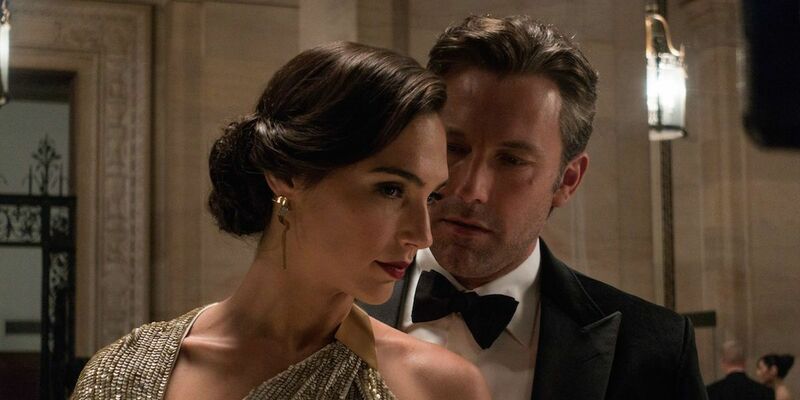 While I personally don't have a problem with Diana sneaking around and acting as a spy (she worked with Military Intelligence in the classic comics as Diana Prince and was a DEO spy in the modern era), I'm amazed there wasn't more outrage from Wonder Woman fans about the avatar of Truth behaving in a deceitful manner. 24. Did anyone else see the start of the post-apocalyptic (or should that be post-Apokolyptic?) dream sequence and wonder for a minute what George Miller's JLA movie might have looked like? Or wonder what mods you have to install on Fallout 4 to get this to happen? 25. The whole sequence with Batman chasing after the Kryptonite shipment reminds me of the driving sequences in Arkham Knight. For all the wrong reasons. 26. Superman's cape looks HUGE as he's flying over Washington DC. 27. 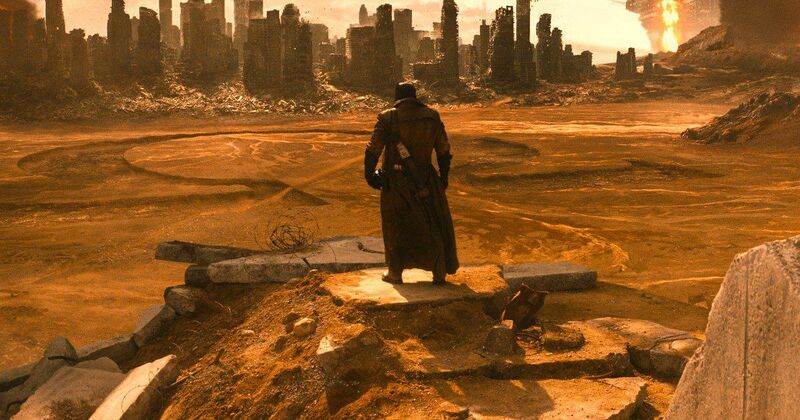 Granting that he can hear and see if anyone might be injured instead of vaporized by the bomb, Superman standing in the middle of a burning building looks strange. 28. So we have this Kryptonian archival computer, totally unlocked, accessible by a hand-touch, containing information on over 100,000 worlds... and there isn't a team of scientists pouring over this 24-7?! 29. On that note, Lex Luthor is the dumbest genius ever. Faced with this treasure trove of knowledge, the likes of which man has ever known, what is the first thing he does? Start playing around with a device that modifies DNA with the same skill and finesse as The Cat from Red Dwarf. 30. Also, did anyone else notice that Zod's corpse is smooth as a Ken doll "down there"? 31. RE: The Pa Kent dream sequence. It's totally random, but I can forgive it since we get to hear the speech Pa Kent SHOULD have given Clark in Man of Steel about how unintended consequences shouldn't stop you from trying to do good. 32. The Pa Kent scene is also a nice, subtle segue into the next scene, where Bruce is pondering his own father's teachings in the ruins of Wayne Manor. Another subtle reminder of how Clark and Bruce aren't that different. 33. I take it back. Jesse Eisenberg isn't channeling Johnny Depp's Willy Wonka - he's becoming Heath Ledger's Joker. Just look at the hair and the purple trenchcoat! 33. This may possibly be the most obscure reference in the whole movie. In the video of Cyborg's creation, his father mentions a number - 61982. Cyborg's first appearance in the comics was in Tales Of The Teen Titans #1, which was released on June 19th, 1982. Or 6/19/82. 34. 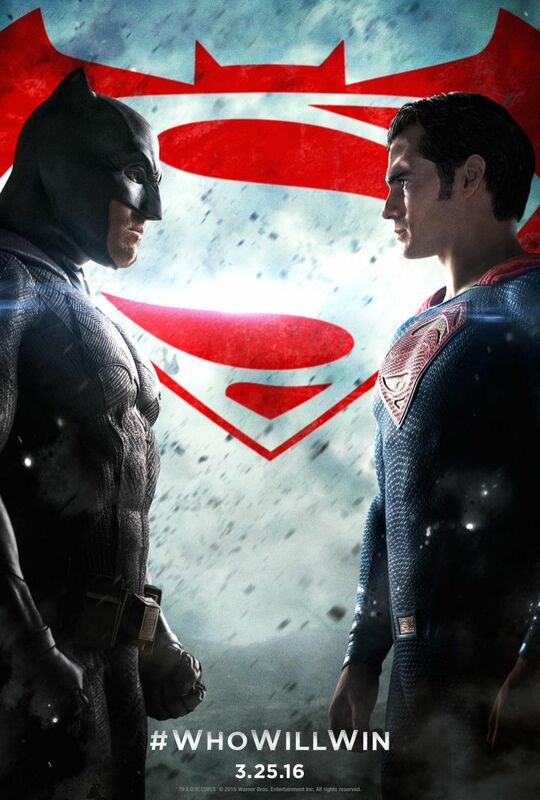 The fight between Superman and Batman DOES look awesome. But Superman shoving Batman when he shouts "I UNDERSTAND!" serves no purpose other than to provoke a fight that doesn't need to happen.. except for the sake of giving us the titular fight of this movie. Clark should have just tried talking to him then, calmly and rationally and explained that his mom was in danger. Of course then we wouldn't have gotten the fight scene, so forget it. 35. Batman swinging Superman around on that bat-rope just looks goofy as hell. 36. Why on Krypton does Clark use his mother's first name when he's begging Batman to help him instead of "Mom"? Yes, both of their mothers are named Martha. It's a fascinating bit of trivia and it makes the characters bond but it makes no freaking sense for Clark to not say "Mom". 37. With Martha Kent a hostage and Lex doing God only knows in the Kryptonian ship, time is of the essence and the situation is urgent. But not so urgent that Bruce can't change out of his power armor and into a second Bat-Suit he just happened to have with him. 38. Bruce forgetting about his Kryptonite spear and leaving it behind is just dumb. 39. Leaving Lois behind? Slightly less dumb, but still pretty dumb given that Clark knows Luthor was watching the fight remotely. 40. So Lex decides to taunt Superman while standing between him AND the nightmarish abomination he created to kill Superman? I say it again - Dumbest Genius EVER. 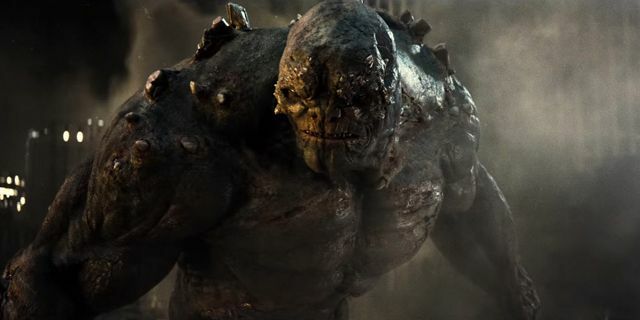 I fully expect to see Doomsday doing to Lex what Hulk did to Loki in the inevitable How It Should Have Ended parody. 41. Who else expected Aquaman to show up after Lois dropped the Kryptonite spear in the flooded pit in the basement of the port building and start lecturing her about surface-dwellers dropping their junk the ocean? 42. Yes, it would have been coincidental as hell, but Aquaman totally should have shown up to save Lois when she got trapped underwater and joined the fight then. Of course HE could have used the spear on Doomsday and then Superman wouldn't have to die. So forget it. 43. I full expect to see THAT happen on How It Should Have Ended as well. 44. Another little thing I liked - Clark mailing his engagement ring for Lois to his mother's house. Because he knew there was no way he could hide anything from Lois at work or at home. 45. Amy Adams is a marvel as Lois Lane. The bits of Lois being an investigator are great and I'd love to see her star in a solo movie. We'll never get it, but I'd like to see that. 46. Gal Godot nails the part of Wonder Woman and I can't wait for her solo film. 47. 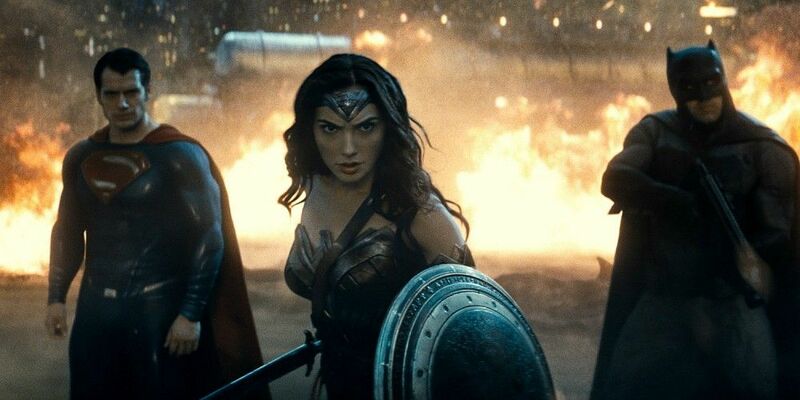 The fight between the Trinity and Doomsday... okay, let's be honest.... the fight between Wonder Woman and Doomsday with Batman lining up his shot and Clark providing air support does look amazing... except for the cheap CGI for Doomsday. 48. The series of false endings as the movie closes are almost as ridiculous as the end of The Return of The King. 49. It should have ended with Bruce's line - "Man is still good. We break things, tear them down, but we can rebuild. We can be better, we have to be." 50. Take that last line as a mission statement for Justice League, Zack Snyder! Final thoughts on a second viewing? I like the movie a little more. I still don't love it but I can appreciate the craft of it all. Yes, it is flawed. Yes, a lot of stupid things happen to justify the action sequences. There's way too much going on. And we could have cut the dream sequences without losing anything. But the performances are great across the board, with one glaring exception and I can't even blame Jesse Eisneberg for that because so much of it is down to the direction and script. The production values are great, with some wonderful designs in regards to the sets and costumes. The musical score is amazing and well-mixed. And the movie makes some good points regarding the nature of heroism and how we view it in modern society. In the end, that's just one critics opinion. I encourage you all to go see the movie and decide for yourself.